Several months ago, Mr.Liu was diagnosed positive (++++) in his urine when checking routine urine test in local hospital, but he felt nothing difference, after that he checked the blood glucose, and result showed normal. The doctor told him, too much “+” of glucose in urine is abnormal, and ask him to recheck. So Mr.Liu checked again blood and urine glucose for many times, fasting blood glucose is 6.0-7.0mmol/L, blood glucose after 2 hours meal is 8.0-11.0mmol/L. The local doctor diagnosed it as early period of type 2 diabetes, then asked Mr.Liu to control meals and take sugar-reducing medicine. During the drug period, Mr.Liu had too much panic, hand tremor, dizzy and sweat , blood glucose was not stable, sometimes high sometimes low. Mr.Liu heard that there is heredity of diabetes, so he brought his son Tom together to hospital to have a check. Tom’s test result was similar as Mr.Liu, so he was also diagnosed as type 2 diabetes. The doctor gave Tom the same medicine, and Tom’s treatment effect is also the same as Mr.Liu, there was no symptom before treatment, but there was lot of problems after that. The whole family of Mr.Liu were very worried and anxious, finally they descided to go to big hospital (our hospital) to check again. Knowing the detailed medical history, I asked them to stop all the medicine, and check some parameters like glucose tolerance test, Islet function, kidney function, renl glucose threshold, Urine routine test, quantitative test for glucosuria and renal tubular acidosis. The result showed that there was no problem except enl glucose threshold decreased a lot and positive result on urine glucose. And renal glycosuria from chronic kidney disease or Fanconi syndrome was excluded. From this case that Mr.Liu and his son with the same disease, genetic predisposition and other clinical features, ultimately we confirmed they are suffering from " Familialrenal Glycosuria ", Renal glycosuria is due to the renal tubular reabsorption of glucose decreasing (renal glucose threshold decreases), so blood glucose is normal while urine glucose was completely ruled out. Normally it is happened on pregnant women, familial renal diabetes (also known as "primary renal diabetes" ), chronic kidney disease, hereditary or acquired renal tubular disease. Renal diabetes always has some relationship with some renal tubular defects, which is characterized by positive urine sugar and normal blood glucose, regardless of fasting or after meals, any urine sample contains sugar, but fasting blood glucose and "glucose tolerance test" is normal. “Normally no need treatment to most the “Familialrenal glycosuria”, the patients generally have no symptoms. But a small part of these patients would turn to real diabetes in the future, so the renal glycosuria patients need follow-up observation. “ When I told these words to Mr.Liu, he is finally relieved and come back home happily the next day. Such misdiagnosis as Mr.Liu is not rare, especially in the rural area. 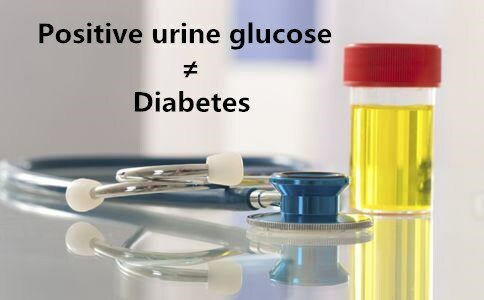 There are many reasons for urine glucose, positive urine glucose can not determine to be diabetes. Diagnosis of diabetes is based on blood glucose rather than urine glucose. Those who found positive urine glucose, should has further check on blood glucose, if necessary, also do other related parameter test. In order to correct diagnosis, do not easily make the diagnosis of diabetes from a positive urine glucose result.